“Comprometidos para fortalecer a los niños por medio de la educación y mas allá“. Congratulations to both the Boys and Girls Soccer Teams from Winters High on their combined League Championships for the Sierra View League. Really proud of these students and players who represent our town well throughout greater Northern California. Now on to the Northern Section Championships. Many of us have seen these players literally their entire lives and to see them become the champions they are on the field and in life is absolutely amazing! Go Warriors! On Sunday, February 10 at 2:00, the City will host an information briefing for those affected and interested in the overflow of the detention pond behind Foxglove Street near Ivy Loop. We will give an overview of the cause of the overflow, information about the operation of the pond and moving forward. The meeting will be in the driveway at 620 Foxglove so bring a soccer chair. If it is raining, we will move down the street a bit to the Public Safety Facility, 700 Main Street in the Emergency Operations Center Conference Room. The Buckhorn Food Truck is now on the corner of Railroad and Grant Ave. A chance to get your tri-tip sandwich fix and support a really good local business! Congrats to Silverio and the entire team on going through the process and getting this going! On Friday (today) at 4:00 at the NE corner of Railroad and Main, the “Before I Die” public art wall will be unveiled. The project is sponsored by Yolo Hospice, Winters Participation Art, Winters High School Art Students and the Winters Healthcare Foundation. The wall will be up for about 6 weeks. Pretty cool project! Movie Night with the “Night Shift” and Winters PD and Fire will be on Saturday, February 16 in the apparatus bay at the Fire Department. They will be showing “The Grinch” and provide snacks. Admission is Free. All are invited! Today is Karla Sanders final day with the City of Winters in our receptions area in the Finance Department. We wish her the best with her future endeavors and thank her for her services with the City of Winters! Good job, Karla! Congratulations to recently promoted Sergeant Jose Hermosillo on his swearing in at the City Council Meeting surrounded by his fellow officers, family and friends. Sergeant Hermosillo is a testament to hard work, professionalism and will represent the Police Department well in his new position. Staff is working with the WJUSD and the Department of Industrial Relations in the development of apprenticeship programs within the Winters Community. Dan Maguire is the lead on this and advancing opportunities for WHS students. Well done. Blue Mountain Terrace Senior Apartments are working toward the start of construction with a final financing call and readiness for a March groundbreaking. Staff is working with State Parks to position the City for some Prop 84 Grant Funds. Both Winters Fire and Police have started fitness challenges over the next month. When you see them out and about, give a cheer for getting healthier. The Police Department will be limited operation next week as Karla Fergeson is on vacation for a week! Winters Fire will be advancing the final draft of the Community Wildfire Protection Program before the Winters Fire District Board, City Council and the County Board of Supervisors over the next month. A real collaboration and a good start on shoring up the interface areas of the Greater Winters jurisdictions! Kudos to Art Mendoza for his work on this. Finally, the past few years has seen leadership of our Police and Fire Departments within the region through training, mutual aid and our collaboration with our neighboring jurisdictions. The emergence of the influence of our staff within the region has become a hallmark of the pride and professionalism with pulses through our organization. I have learned that it really is all about the “people” of the organization who extend our reputation. I cannot adequately express the feeling of being at a meeting when someone from another agency tells me they are “working with” someone from our team on a very meaningful project or effort which advances the profession. As one of the smallest agencies, I will profess that it is tough living within the limited resources. The adage of having to do “so much with so little” gives me even more motivation when I see our staff giving the extra effort to keep up with our neighboring jurisdiction which have resources beyond our comprehension. It means we are working hard! Hard work is one of the character traits which defines Winters. Our agricultural roots help establish the benchmark for accepting the effort it takes to achieve the excellence which is embodied and permeates through the Winters community. Our kids are champions on the playing fields, classroom and FFA, our environmental projects make salmon spawn in our creek, we produce the best food in the world, we are the home to a world class vocational training academy with the PG&E Gas Safety facility and our City Staff are second to none in the professional fields. Our Downtown is best in the region and people want to be here because of an incredible vibe. None of this just happens. It really comes down to a culture of hard work and commitment to being the best. Really proud of some of our recent achievements and how we set the bar for other communities. Small yet mighty! No Friday Update next week. Have a good weekend and go Warriors Soccer in the North Section Soccer Championships! Strategic Planning Workshops Postponed- Stay tuned! The previously scheduled community workshops on strategic planning, community facility, etc are postponed pending the development of a new calendar. We have 22 people on our “must attend” list and unfortunately the schedules with many of our other regional evening commitments and meetings has developed many conflicts. We are working a revamp of the schedule, so stay tuned for a new schedule. The City will be contacting homeowners affected by the flooding in the Dry Creek Meadows Subdivision on Monday. Hooby’s Brewing received their final building inspection approvals today. Look for them to open around the third weekend of February. City Staff successfully completed the “tie in” of the West Main Sewer Pump Station. The project was a big step for our wastewater system which will eventually result is the diversion of almost 30% of the flow from the East Street Pump Station, increasing the efficiency and capacity of our wastewater system. Parking Regulation: All ordinances have been revised and will be in full effect within the next few weeks. Enforcement times, fines and posting of signs, striping of curbs are all on the cusp of completion. Enforcement: Staff has been trained, citations ordered and delivered and the chalk stick is ready. We will begin with a process of warnings then move into citations in February. Striping: the entire Downtown has been re-painted. Additional diagonal spaces have been added on Abbey and Main. In the end, we will net in excess of 20 additional spaces from the striping. The last striping will occur on First Street, Edwards and Baker in the coming months. We have focused on the enforcement areas first then will move to the rest of the core area. First Street Parking Lot: The Winters Hotel construction will move off the property where the parking lot will be constructed in March. The lot will bring 38 parking spaces and a new alley. This should be a big deal for those along Central Main Street who will see almost a doubling in spaces, a lighted parking lot, paseo parkway onto the mid block and added convenience for many. We expect the parking lot to be done in May/June and ready when the hotel opens. Combined new spaces from both striping and the new parking lot will be somewhere near 68 spaces. Waste Management has hired a new contractor to take over street sweeping, beginning in March. Also discussed compacting for recycling & trash, and front loaders will still be needed for compost. 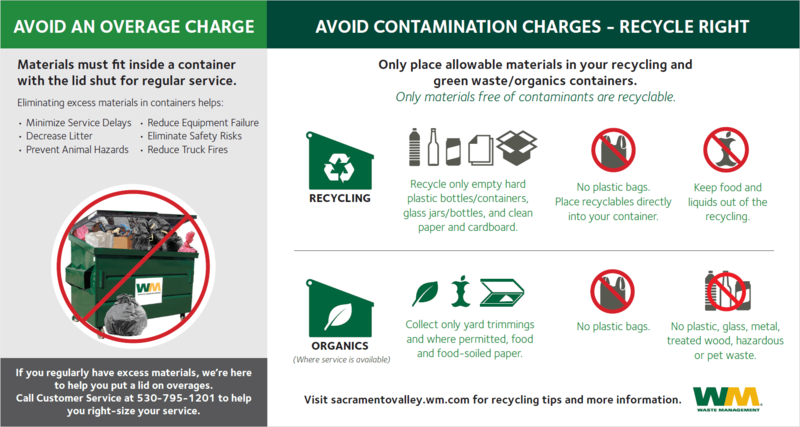 Contamination and overage fines for commercial accounts have begun ($150/overage, $50 contamination). Also, recycling can’t include plastic bags. Staff has been working on finalizing the City’s Climate Action Plan. The document will cover a six (6) year period to 2025 and include a revised implementation program which provides for public education, adoption of some key programs meant to reduce greenhouse gases. Look for the plan to go before the City Council in May. Staff will be working with Yolo Housing on a new service agreement. Our partnership has resulted in some cost savings and efficiency which may result in a reduction in the rate portion dedicated to capital equipment replacement. Good stuff! Staff is working with the Putah Creek Council on the installation of interpretive signs on the creek trail portion next to the PG&E Facility. A tour of the new Yolo Food Bank on Wednesday showed the advancement of this critical service in Yolo County. 3rd Annual Movie Night with the night shift will be held on March 16th at 5:30 p.m. in the Public Safety Facility’s fire bay – “The Grinch” will be featured. The Community Wildfire Protection Plan Draft is almost ready for public viewing. Look for a release prior to the upcoming meeting of the Winters Fire District Board Meeting. Attended a great SACOG Regional Manager’s meeting; SACOG rep said Winters was the perfect city for the “Green Means Go” pilot program that includes infill projects, travel options and EV options to decrease gas emissions in the region. For all the no growthers out there, its time to get a refill on the big bottle of tums and the Costco size Excedrin because the State is ready to release the new Regional Housing Needs Allocation (RHNA) numbers with direct correlation to transportation and road funding. Staff attended a RHNA meeting with SACOG and although the City will be receiving $125K, these funds can’t be used to update the housing element. Staff will look for an alternate way to utilize these funds within the context of RHNA and affordable housing. The EDAC report will be re-written, and based on the recommendations from the EDAC, it’s a good time to go to the Planning Commission and City Council about the Regional Housing Needs Assessment (RHNA) process as everyone’s numbers are going up. Regarding transit, the City pays a large amount of money for Yolo Bus. Micro transit models may be explored. We need to look at the needs for seniors. An app on a phone could enable someone to be picked up along the scheduled route. There is a lot of potential here. services in Yolo County, based on the staffing and programming levels recommended by KSMP. A couple items as I return from two weeks out of the office! Heavy rains from the past couple weeks brought flooding to parts of our town on wednesday, affecting a number of homes. Kudos to Winters Public Works and Fire for their response, literally working through the night from Wednesday into Thursday to unclog drains and pump flooding water. Planning Commission Meeting will be held on Tuesday, January 22 and will include a Permit for the Buckhorn Food Truck and a review of the draft Vacation Rental Ordinance. The Strategic Planning Workshop on Economic Development previously scheduled for January 23 has been cancelled and will be rescheduled to another date. Delays in the production, review and relesae of the Economic Development Committee’s Report and Recommendations is the reason. Stay tuned for updates on the meeting days and times. Good news in Transparency for the City of Winters Website. The City scored highest amongst all Yolo County Agencies for our website transparency in grading done by the Local Agency Formation Commission (LAFCO). LAFCO actually scored 2 percentage points higher, but they were doing the grading, so I am giving us a bump! To review the report, go HERE. Saturday evening is the Year in Review and will honor Linda Glick Landes (Citizen of the Year), Karen May (Senior of the Year), Baldo Arce (Theodore Winters Award) and the Treehouse is Business of the Year. Finally, the ambush and murder of Davis Police Officer Natalie Corona is a staggering reminder of the dangerous world we live in and the risks our law enforcement personnel take on a daily basis. Just a senseless incident, taking a young officer who had her life and career in front of her mostly before it ever began. At the memorial service today, Winters was represented by our Police Chief John Miller, Sergeant Jose Hermosillo, Officer Alan Pinette, Department Chaplain Robert Duvall, K9 Kepi and our the entire Police Cadet group. I saw them before they left and could not think of a more appropriate group to represent our town. I was immensely proud and honored by them. Winters Police Personnel were also on patrol in Davis during the memorial and procession for Officer Corona to her hometown of Arbuckle. The threats to our law enforcement grow daily. California is a State with a dichotomy of interests which make it very difficult to be a police officer. Laws, initiatives and interests challenge and work to redefine the entire field of law enforcement almost daily. In today’s world, police have become the social workers of the streets, dealing with the many folks bitten by mental and emotional health issues previously dealt with through a broader dealing legal system. At the same time, legislation and initiatives have decriminalized and legalized certain offenses and behaviors which many in society do not completely understand. When you add in various levels of media and political sentiment towards law enforcement, its tough! Yet, it is these same individuals who keep our communities safe, protecting us from those who do harm or the first we will call when we have a major issue. They are the ones who enter some of the most dangerous situations in the name of service and duty. They confront the worst in our society while consoling those in their most dire moments. In Winters, I have witnessed some of the most incredible moments of compassion from the Winters Police Department to help those in need. Heroism comes in many forms, sometimes in the physical but probably most often in the emotional and support to those who are most affected. As I watched today’s memorial I was gratified that they focused on the hope and enthusiasm that Officer Corona brought to her job as a Davis Police Officer. Hopefully there are people who can take motivation from Natalie Corona who will step up to fill her career destiny for her. She was immensely proud to be a police officer! Without question, her memory will live forever in the hearts of her colleagues and family. Being in law enforcement is unquestionably one of the most challenging and honorable professions. I personally am honored to work with these men and women and am grateful for their service. Hopefully people will light a candle tonight for Officer Natalie Corona.